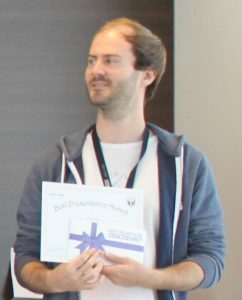 During the STOE Lab meeting in September 2017, Falk Meutzner could win over the poster-prize jury for his work on battery materials, which gave me a reason to interview him. He studied Material’s science at Technische Universität Dresden. During his studies, he tutored during several lectures and after he graduated in 2013, he became a research assistant at Technische Universität Freiberg in 2013, where he is still happily doing research. Falk did several internships during his studies and work-life in different countries, such as Denmark, Portugal, and Israel. His list of accomplishments is quite long, it includes five patents, six publications, several scholarships and another poster prize from the Young Crystallographers during the meeting in Bremen 2014. Make sure to check out his poster! What fascinates you most about battery materials? I find it quite intriguing how it is possible to store and convert energy from electrical to chemical energy and how the atomic environment changes the chemical potential of atoms/ions in the solid state. The possibilities from this process are, of course, vast, as we can already see almost everywhere (smartphones, mobile electronics, electronic cars…). It would be great if we could advance renewable energies this way. In the future, these sustainable concepts will become increasingly important (increasing population and decreasing resources, etc.) and it would be nice if we could contribute this way. What was the most fun part of your project, so far? I have always been a big fan of large data analysis and the tedious hand work connected to it. I usually have a good time putting on my headphones with the King Crimson discography and do repeating work procedures for some days. In the end, (sometimes) you get some nice-looking results (sometimes also not) and you can see that from underneath the numbers and tables, there seems to be some reasonable conclusions. Apart from this I had many opportunities to go abroad and it has been really fascinating to be in Israel and Russia for example. In your opinion, where should be more focus in your field of research? Since interdisciplinarity is vital for battery research, I think it would be very important to deepen this quality: Bridging electrochemistry and crystallography is very complicated because of the different languages spoken, but the benefit you can gain will be significant. Materials are usually the key for new/better technologies and only a holistic analysis will help to mature concepts to actual application levels. You did a lot of data mining on crystal structures, what are your recommendations for people who would also like to use data mining for their work? Be patient and don’t be afraid to go into single entries. You will always find mistakes in the database and you should report them! You either need to use a ready-made software (I use ToposPro and statpack: topospro.com) or write your own scripts (e.g. in Python). There is so much data in some databases that it is possible to get a lot of correlations down. Therefore, I think, the most important part of this is to ask the right question; you cannot just start doing it and see where you land. But with a concrete question and task, there is much to be discovered.